This week on my blog it seems there's hardly been a day without grain. After the Wheat King, corn dollies and a wicker man, here's a maize maze. It was constructed by Millets Farm Centre near Abingdon in Oxfordshire as a fun family day out. 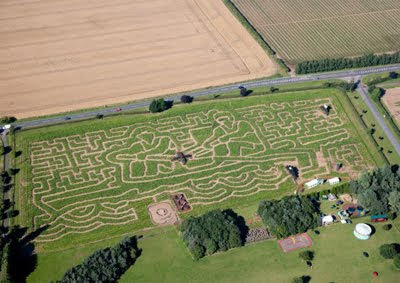 The maize maze is an annual sight at Millets Farm, which held the world record for growing the first one in 1997. The crop created nearly four miles of pathway and covered eight acres. This year the theme is The Animal Games and includes a rowing boat as a tribute to the Olympic Games in London 2012 and the Great Britain team. Previous designs include a windmill, dragon, pirate ship, clowns and the White Rabbit for last year's Alice in Wonderland theme. The maze was planted in April, and got off to a slow start because of the wet weather, but the warm sunshine of recent weeks has helped it grow to a good height. “We are hoping this interesting mixture of weather conditions will give our Maize Maze the growing power it needs to be one of the tallest and best mazes in the country,” said Millets Farm events manager Helen Bloomfield. Families can bring picnics into the Maize Maze, but refreshments are also on sale at the farm. If you are going, allow a couple of hours to complete the entire maze, which is in three sections. It is open from 10am to 6pm, seven days a week until 4 September. There is free parking and other attractions, including activities for kids, on the site.